If someone comes out and does what they say they're going to do and is fair with their price and quality ... well, you've earned my business. As you look at the photo, the 5-foot gate on the right was already there. We have a conservation area in the back that's got all kinds of birds and small animals in it, so they need access in order to clear the little pond there. Although I was first told that 5 feet would be enough, when they came out, some of their equipment just didn't fit through the gate. I had to expand the gate or take down the side fence -- which I didn't want to do -- so I contacted the homeowners' board, and presented my idea. I just did a rough drawing on my own of how I could solve this and the board was fine with it. We had another piece in there, a regular panel fence, so the contractor would have to remove that and put the new gate in to make an opening of 10 feet. It didn't have to be 10 feet but since I already had a 5-foot gate, it was a lot less expensive to just add one gate than two 4-foot gates. As you look to the right, the fence continues. When we first moved in, our neighbors had a wooden fence that was really beat up. I mean, it was probably 15 years old and really didn't look very good. I went to Home Depot to look at their vinyl fencing material and do some research. 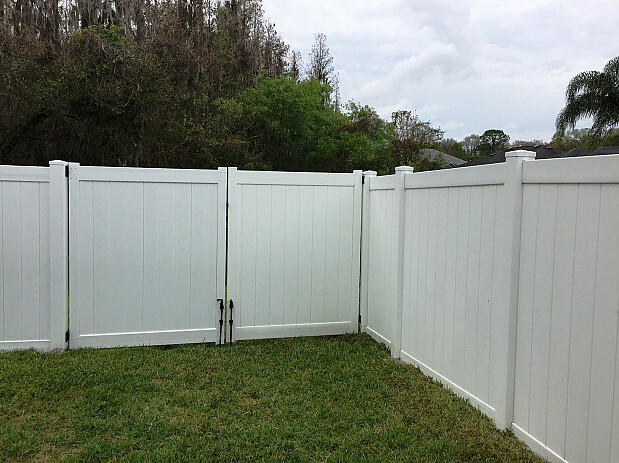 The quality of it was as good as anybody else's material, plus they have outside companies that do the fence installation. So my neighbors and I had it installed, and I added some fence on the other side and another gate. Between us, I think we spent about $18,000 with this company at the time. But when I called them later to say that I had to add this piece to the fence, they answered, "Weeellll, it's not really worth our time to come out and do it." I was pretty upset about that, so I called Home Depot. They really got on them, till the company said, okay, they'll come out now, but I told them, "You know what? I'm not interested. 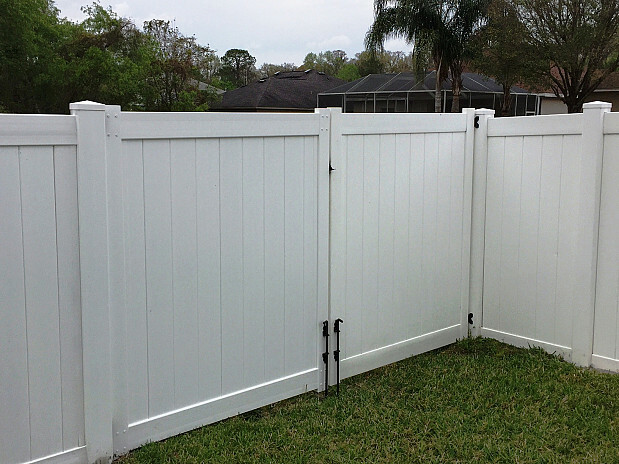 I'll get an independent to do this, but I will buy the material from you because I want it to match the fence." And so I did. I went online and filled out a form and got 3 or 4 companies to call and speak with. I called 3 of them -- one of which was the one we used. Another of the guys called back and told me, "I'll come out and look at it." So I said, "I can send you photos." He repeated, "Well, I wanna come out." Three or four days passed ... nothing. So I called him again. I asked, "Is there a problem?" He replied, "Oh, I just forgot." Soo ... he was off my list! And the other one was just kind of giving me a little bit of a runaround. The first company I'd called seemed like nice enough people. They're fairly local contractors and I like to support the local people. Their quote wasn't lower, but it was a good quote. And they could get it done right away and they were insured and bonded -- because you know, you always have to be concerned about that when someone's working on your property with power tools -- so I hired them. Home Depot sent the material via UPS. I put the gate together; it was pretty simple. You have a top and bottom rail and you just slide the panels in, and then you do the outside, so it goes pretty easy. Then I would say that the contractors were here no more than 2 hours to get the whole thing done, taking off the other panel, locating another hole for the pole, digging that hole, putting the concrete in ... all the little things you need to do and be sure that it's going to be correct. They brought all the materials with them. I didn't need to provide them really anything. And of course they leveled it all out and you can see the gates match perfectly. Cleanup was immaculate; it was like they were never here. The good news is that there was not one surprise -- it was exactly as I expected and it worked out. These guys, they just did a really great job. I couldn't be happier. My wife and I are very satisfied with the work we had to do. Matter of fact, the homeowners association were out just a week ago, just to check it, and they said, "Wow! This is really perfect, but you only needed an 8-foot opening; you didn't have to do the 10-foot." I explained to them that since I already had a 5-foot gate there, it was a lot less expensive to add another 5-foot gate. It doesn't really change the cosmetic of the fence or the structure, so it worked out well. The nice part is that the company basically does everything except flooring and roofs, so anytime I need anything else at the house, they're going to be the first one I call. I'm an old-fashioned guy. I mean, price is important to me but not as important as the quality and everything else. I would advise other homeowners, for their own peace of mind, to get a couple of quotes but to rely on someone who you can see has done the work. I mean, I could tell people about this all the time, but when I take a photo of it and let everybody know that the gate on the right was already there, they can see how perfectly the contractors matched it. The proof is in the completion of the job.